Driving west out of Bowen, fields of alfalfa or grapes slowly give way to feed stores and warehouses. An ultra modern Shell gas station sits as a sentinel on the south end of town. As the road gets wider and is lit by street lamps, traffic becomes more congested-soon, you're weaving in and out of traffic like a local. Lanes are virtually disregarded, scooters and cars intermingle with trucks from area farms. Bicycles are everywhere-along the shoulder of the road, or mixed in with the cars; crossing into traffic. It's not uncommon to see a young mother, riding a bicycle with her child sitting sideways on the cross-bar or on the handlebars of the bicycle . Often the 'driver' is also smoking a cigarette and has her shopping bags dangling from the handles of the bike. 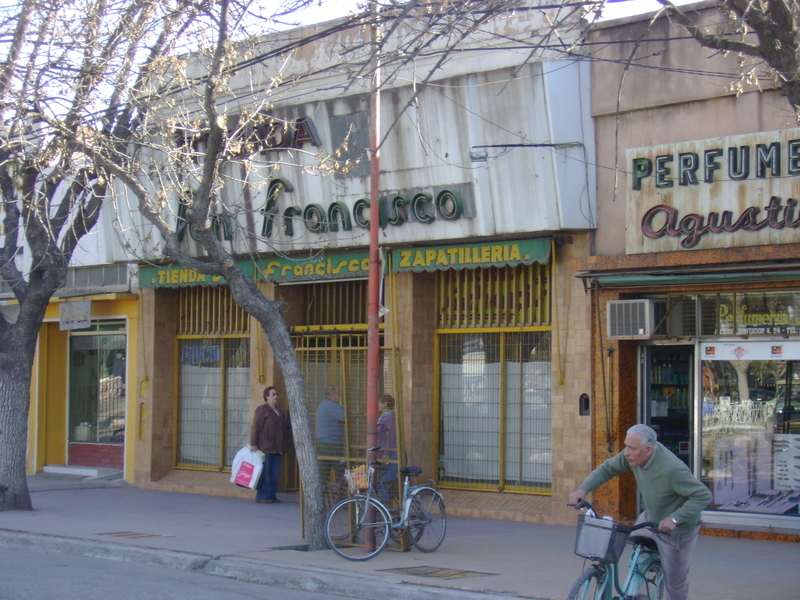 The downtown area of General Alvear is a time warp. As these photos show, everything was built in a Peronista flurry of prosperity, and has been more or less preserved and kept up, but not modernized. The flower shop above is where I got my bridal bouquet-a clutch of salmon and white anemones-for about $7. The shop is full of black buckets of cut flowers, silk and real plants, and along the wall behind the register, picture upon picture of saints and the Virgin Mary, (with the occasional family baby photo) almost to the effect of wallpaper. Silvia the florist lives in the back of the shop, which is not uncommon-the store front gives way to an apartment that looks totally different than the shop. 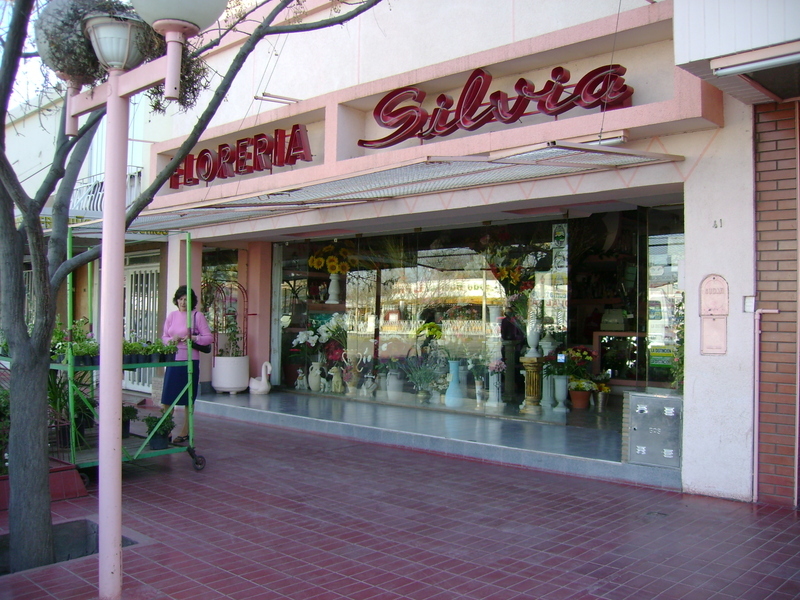 Alvear has many things Bowen doesn't: shoe stores, cafes, restaurants, supermarkets and specialty shops, florists, heladerias, bookstores, furniture shops, a casino, a nightclub, fabric stores, clothing shops. There's a university, too, where my brother-in-law teaches business and economics. The town is divided by a man-made irrigation ditch that has been made into a scenic attraction by adding a water wheel to it. 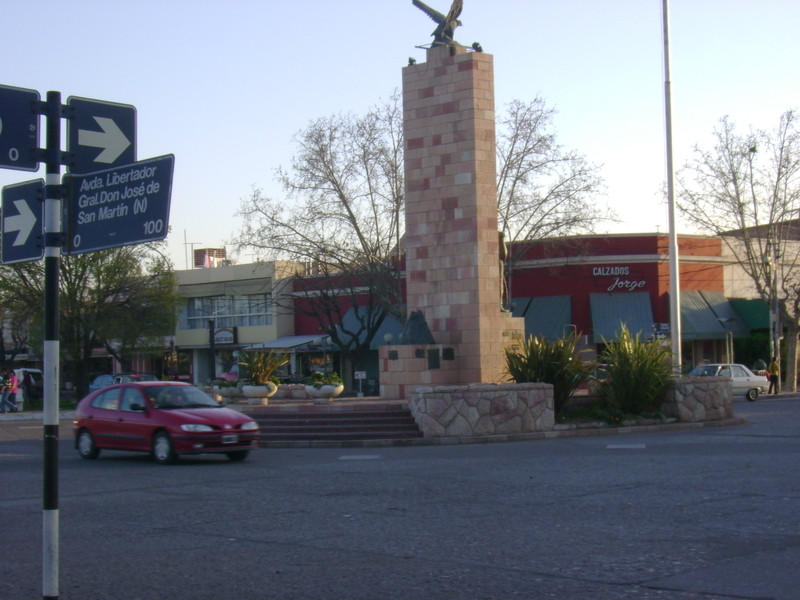 The photo above is of the main round-about in the center of town. It's near the municipal buildings, town square, church and bank. This town is almost unknown to those from outside (it's not exactly a destination), and except for the occasional passing tourist on the road to Mendoza, no one bothers to come here. For the people in the surrounding rural areas, the city is their link to the rest of the world. Dusk falls in Bowen and the window is open, letting in the occasional cool breeze from outside and letting the heat out of the kitchen. Out in the yard, Indio, my in-laws' crop-tailed brown mutt, runs along the fence, barking furiously. People call greetings to each other in the dusty road, I can hear the buzz of a scooter as it zips by. Sometimes gypsies come along, selling pillows door-to-door. Maybe they are drawn to my in-laws' door by the delicious smell drifting out the open window-the smell of pollo con papas. Evenings in Bowen we meet around the table, a much more relaxed and quiet affair than lunch. At lunch, when my brother and sister in-law and their son are over, it's noisy with the ladies bustling around the kitchen, chatting and setting the table, and the men watching their futball, complaining about the scores. We end up stabbing the last few potatoes with our forks right out of the pan they were cooked in. "Asi-Rebe! Like this, Rebe!" My father-in-law, Carlos, tells me, demonstrating how he takes a potato with his fork and pushes it all over the bottom of the pan, getting all the salt and juice on the potato before popping it in his mouth. His hands are huge around the fork, hard-working farming hands, all thick fingers and rough skin. They're hands that have created-coaxed life out of the earth and harvested it. So evenings are for family. After dinner, we sit around nursing glasses of Quilmes beer, watching old movies. Rita Hayworth, Clark Gable, Humphrey Bogart, Grace Kelly-my in-laws know them all. We watch-Gary Cooper, Betty Grable, Marilyn Monroe-it's non-stop TCM. Only all the movies are dubbed in Spanish (no subtitles) so half the time it's all I can do to follow the plot line. But our bellies are full of delicious food, relaxed and full, we watch romances, dramas, and comedies from times past-a simpler time, perhaps; and enjoy the company of family. As they say in Argentina-Panza llena, corazon contento-Full belly, happy heart. 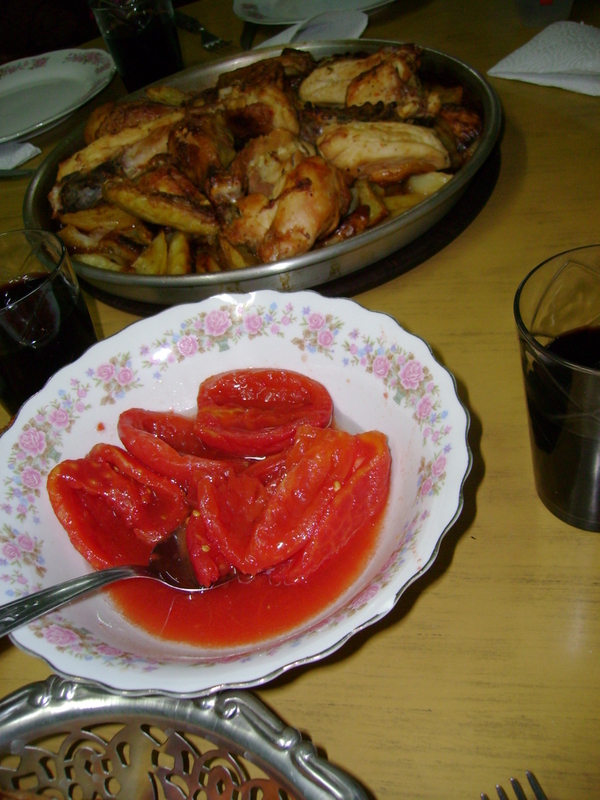 Florencia made this for me as one of my first meals the first time I met her, and I had never tasted anything like it! Since then, it's one she knows will be a hit, and she makes it anytime we visit. It's one of the most satisfying meals I can think of-and the simplest to prepare! The secret is the white wine-it goes the potatoes an extra tang. Preheat the oven to 375 degrees Fahrenheit. Rinse the chicken and remove the packet inside. Put the chicken in a baking pan, and drizzle olive oil over the chicken, rubbing it into the skin. 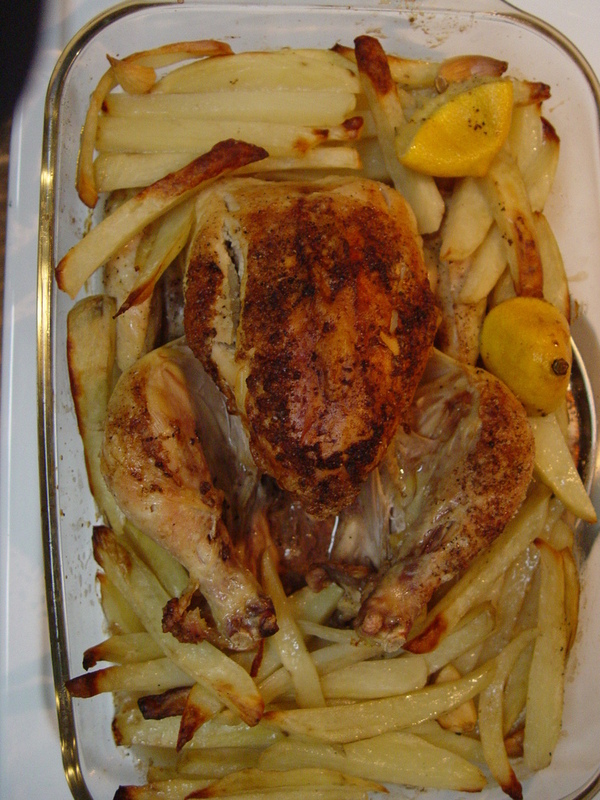 Squeeze the juice of the lemon over the chicken, and stuff the lemon halves into the cavity. Salt and pepper the chicken to taste. Meanwhile, put the cut potatoes in a bowl and drizzle in olive oil, using your hands to mix them around so that they are lightly coated in oil. Salt liberally. Put the potatoes around the chicken in the casserole dish. Place the garlic cloves around in the potatoes. Bake for about 40 minutes. After this time, pull the chicken out, and pour the wine over the potatoes. Increase the oven temperature to 450 degrees. Return the chicken to the oven, rotating the pan, for about 30 minutes more, testing for doneness using a meat thermometer, 170 degrees. This beautiful little plazoleta is just around the corner from the Sheraton Hotel in Mendoza. 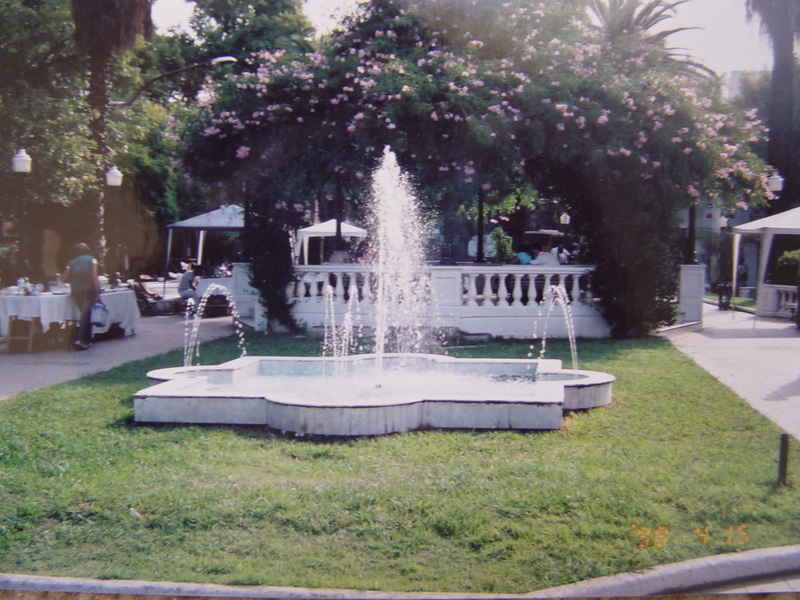 Palm trees, a gazebo covered in flowers, and a fountain transport visitors to another time and place. Close your eyes and you can almost see couples strolling by, gentleman lounging with the paper on a bench, or lovers gazing into each other's eyes in the gazebo. Like its name, the plaza has an Italian vibe--but by way of Argentina. Those tables and tents are for the flea-market held every Thursday through Saturday; Argentina's timeless treasures can be yours for a song--as long as you still have room in your suitcase! The tables are littered with Argentina's past: little metal address plaques (replaced by more modern street signs), old postcards of Buenos Aires landmarks, Eva Peron paraphenalia and heavy old seltzer siphons. Old silver from families who have lost their fortunes, household relics of days gone by. Cars whiz around this plaza in all direstions like it's part of a race circuit. And yet in the midst of the madness, palm trees, frangipani, and the sound of bubbling water give a stillness and calm in the bustle of the city. It's an urban oasis, if you will. In a way, it's a metaphor for how Argentinians view the world: despite the chaos of everything outside, there's always a moment, however brief, to slow down and enjoy something breathtakingly beautiful. 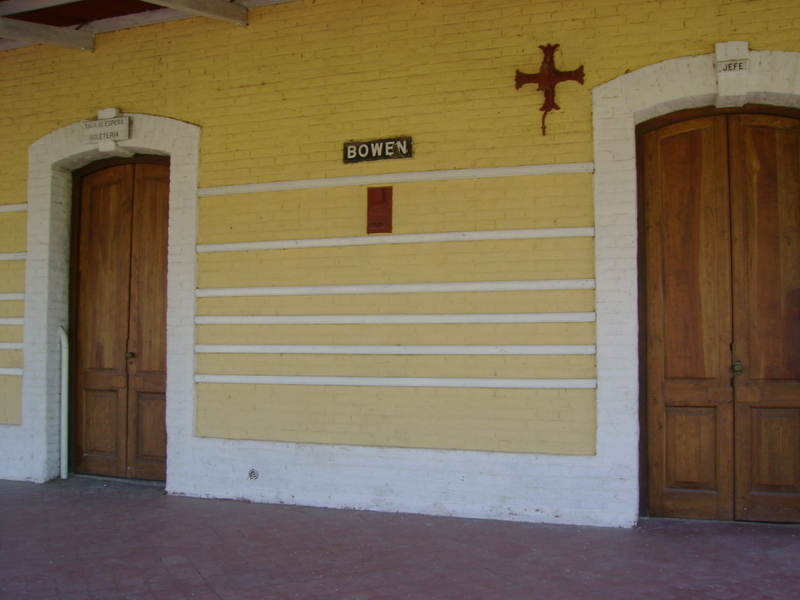 On my first-ever visit to Argentina,we went to tour a family winery called Goyenechea. 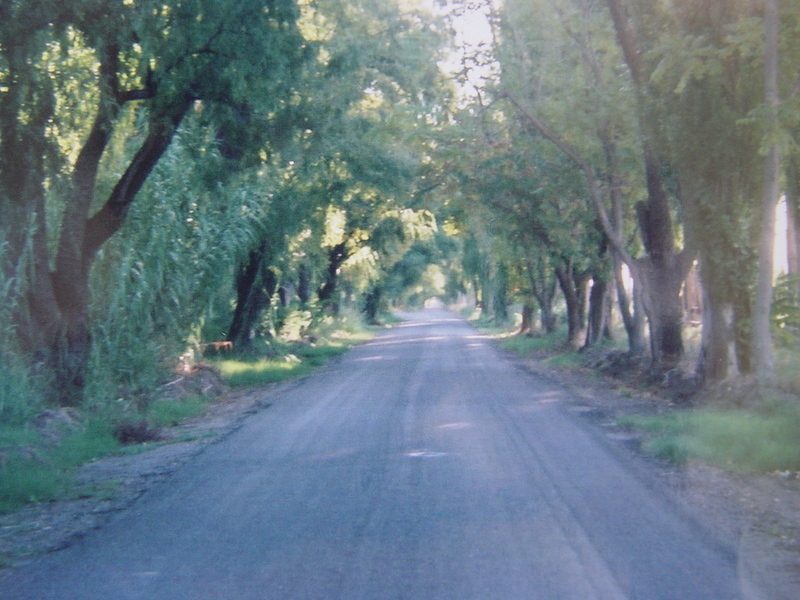 This is the willow-tree lined road leading to the winery. Established by Basque immigrant brothers, Santiago and Narciso, Goyenechea was built in the late 1890s. Their land holdings (1,200 hectares, about 2,965 acres) were once the largest continuous vineyard in the world. It was more like a compound, really: it included the bodega and vineyards, 50 houses, a social club and a school for employees and their families, along with the sprawling family estate (complete with a family chapel). Argentina's rail system has been defunct since the 1990s, and when I win the lotto, I'll invest my winnings in reviving the whole thing, just so I can travel the country by train. There are limited train routes running for tourists, but most of the old routes are not operational. The rail system used to run cross-country, bringing tourists, travelers and cargo from one place to the other. Mendoza produces grapes, wine, plums, apples, quince, olives and olive oil, peaches, and vegetables. These goods still go out all over the country, but are now transported by diesel truck. Many a Bowen resident drives a rig, because Bowen is a good in-between place to live.